Whether it's USA or UK, health comes in the list of priority issues of every country. In India, this task is even more gigantic, taking into account the scarcity of resources and large population to cater, but still the Government, has taken concrete steps to provide an efficient and meaningful health system to Indians. The government has taken several initiatives in this field. Ayush stands for Ayurveda, Yoga and Naturopathy, Unani, Siddha and Homoeopathy. This was started as the Department of Indian System of Medicine & Homoeopathy (ISM&H) in March 1995 under the Ministry of Health and Family Welfare to encourage the ancient Indian medicine systems in today's world. In 2003, it was renamed to its present name AYUSH, under the Ministry of Health and Family Welfare to widen its scope and include Yoga and Naturopathy, Unani, Siddha along with Ayurveda and Homoeopathy. In 2014, when the new cabinet was being formed, a new ministry was formed altogether as Ayush Ministry, to encourage alternate medicine systems in today's world and decrease the dependency on modern allopathic medicine system or in other words changing the cure of disease approach to prevention of disease approach. This provides the people of India a chance to visit back the old and traditional systems of healthcare in India, which has a strong relevance even in today's world. In this project, on 15 November 2015 at AIIMS New Delhi, HLL Lifecare Ltd. (formerly Hindustan Latex Ltd) opened its 1st outlet AMRIT (Affordable Medicines and Reliable Implants for Treatment) to sell generic medicines to patients on highly subsidized rates, based on authentic prescriptions from doctors. Over the last 3 years, 131 AMRIT outlets have been opened across 22 states in India, covering 29 central govt. institutions, 101 state govt. institutions and 1 standalone outlet. In last 3 years, AMRIT Stores have served a total of 65.07 lakh patients all over India. It has sold more than 5200 drugs, implants, surgical disposables and other consu-mables at average discounts up to 60% of MRP. They have sold medicines worth a total of 609.61 crores (MRP) at a total of 273.82 crores to patients, saving a total of 335.79 crores INR to 65.07 lakh patients all over the country. National Pharmaceutical Pricing Authority (NPPA) has put the capping on the price of various drug formulations and medical devices and implants, limiting the profit made by manufacturing companies and private healthcare players and giving relief to the masses. Cardiac stents and knee implants are the major implants whose price were capped, making them in reach of poor and deprived sections of the society. In 2015, Govt. of India, launched the E - Health scheme, under which the Digital India Mission was taken forward and a National Health Portal was started. The National Health Portal aims to establish a single point access for authenticated health information for citizens, students, healthcare professionals and researchers. Users can get detailed information pertaining to health related issues. One can find information related to diseases, health services, tips for healthy living, health programmes, insurance schemes, health apps and widgets. Users can also get helpline numbers, blood banks details, etc. Various online Services and apps like Online Registration System, Mera Aspatal and e-RaktKosh, were started for people of India. The purpose of these apps is to smoothen the way healthcare system works. Now a person can register him/her with various hospitals and book an appointment from his/her home without actually standing in long queues. One can check about the availability of blood products in various blood banks without running from one hospital to other. In January 2015 govt. 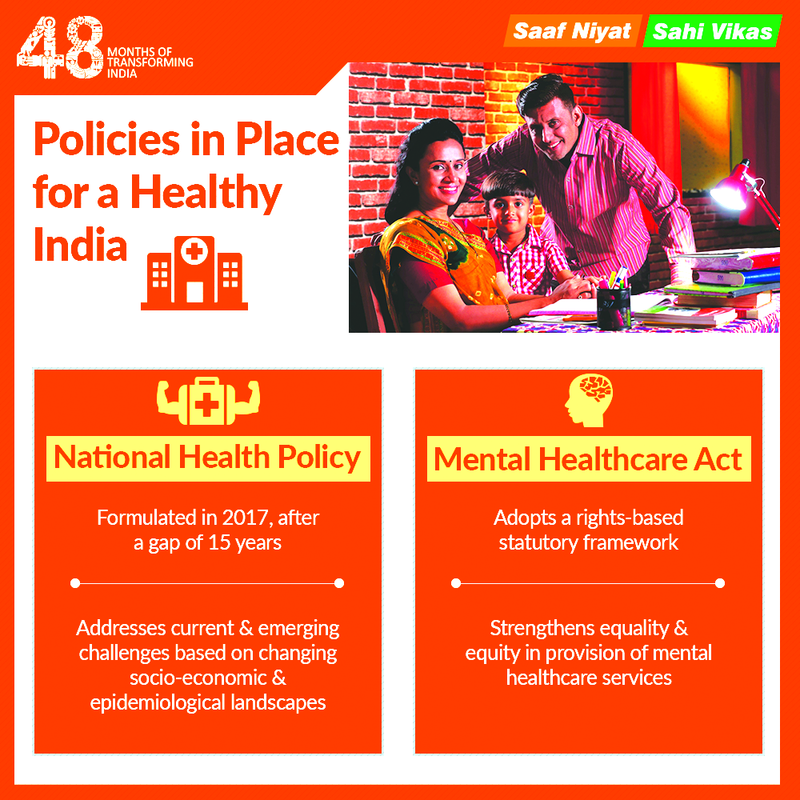 formed the New Health Policy, 13 years after the National Health Policy of 2002. National Health Policy is a declaration of the determination of the Government to leverage economic growth to achieve health outcomes and an explicit acknowledgement that better health contributes immensely to improved productivity as well as to equity. This is a health mission of Govt. 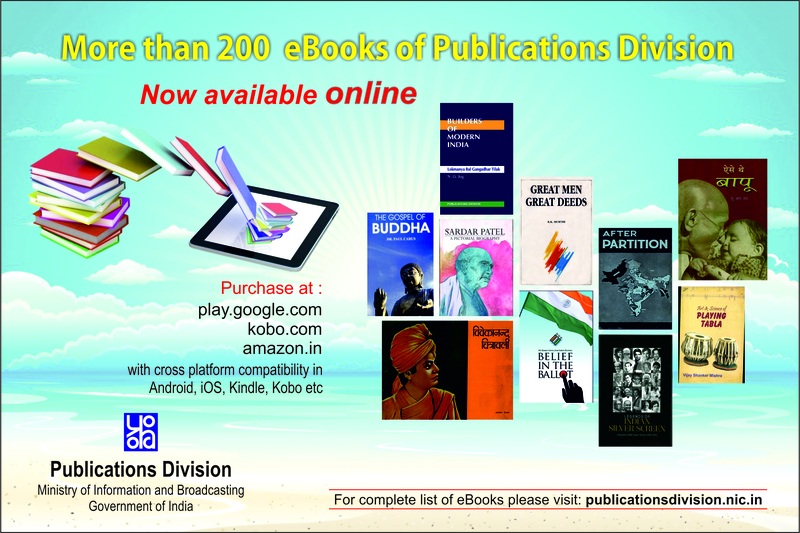 of india launched by GOI on 25 December 2014. The aim of this mission is to immunize all children under the age of 2 years , as well as all pregnant women, against seven preventable diseases. The diseases initially targeted were Diptheria, Pertussis, Tetanus, Poliomyelitis, Tuberculosis, Measles, and Hepatitis B. In 2016, four new additions were made to this list namely Rubella, Japanese Encephalitis, Injectable Polio Vaccine Bivalent and Rotavirus. In 2017 further addition were made to include Pneumonia by adding Pneumococcal conjugate vaccine. Also GOI is introducing "Intensified Mission Inderdhanush (IMI)" in select districts and urban areas of country to achieve the target of more than 90% coverage. In the General Budget 2018-19, Government of India, announced its flagship programme, Ayushman Bharat, which happens to be the world's largest government funded health care programme. People have termed this even as 'MODI CARE'. Ayushman Bharat - National Health Protection Scheme (AB-NHPM), will cover over 10.74 crore poor and vulnerable families (approximately 50 crore beneficiaries) providing coverage upto 5 lakh rupees per family per year for secondary and tertiary care hospitalization. The vision behind this, is to go for path breaking interventions to address health holistically, in primary, secondary and tertiary care systems, covering both prevention and health promotion. This will target poor, deprived rural families and identified occupational category of urban workers' families as per the latest Socio-Economic Caste Census(SECC) data covering both rural and urban. In this Scheme, there is no capping on family member count as compared to previous schemes like Rashtriya Swasthya Bima Yojana (RSBY) which provides cashless health insurance scheme with benefit coverage of Rs. 30,000/- per annum on a family floater basis [for 5 members], for Below Poverty Line (BPL) families, and 11 other defined categories of unorganised workers. This scheme is designed to be dynamic and aspirational and it would take into account any future changes in the exclusion/ inclusion/ deprivation/ occupational criteria in the SECC data. Benefits of the scheme are portable across the country and a beneficiary covered under the scheme will be allowed to take cashless benefits from any public/private empanelled hospitals across the country. One of the core principles of Ayushman Bharat - National Health Protection Mission is co-operative federalism and flexibility to states. Following this, it is proposed to set up Ayushman Bharat National Health Protection Mission Council (AB-NHPMC) at apex level chaired by Union Health and Family Welfare Minister, for giving policy directions and fostering coordination between Centre and States. States would need to have State Health Agency (SHA) to implement the scheme. They can either use an existing Trust/ Society/ Not for Profit Company/ State Nodal Agency (SNA) or set up a new entity to implement the scheme. UTs can also decide to implement the scheme through an insurance company or directly through the Trust/ Society or use an integrated model. The expenditure incurred in premium payment will be shared between Central and State Governments in specified ratio as per Ministry of Finance guidelines. The total expenditure will depend on actual market determined premium paid in States/ UTs where AB-NHPM will be implemented through insurance companies. In States/ UTs where the scheme will be implemented in Trust/ Society mode, the central share of funds will be provided based on actual expenditure or premium ceiling (whichever is lower) in the pre-determined ratio. This will subsume the on-going centrally sponsored schemes - Rashtriya Swasthya Bima Yojana(RSBY) and the Senior Citizen Health Insurance Scheme(SCHIS). Also to control costs, the payments for treatment will be done on package rate (to be defined by the Government in advance) basis. The package rates will include all the costs associated with treatment. For beneficiaries, it will be a cashless, paper less transaction. Keeping in view the State specific requirements, States/ UTs will have the flexibility to modify these rates within a limited bandwidth. In-patient hospitalization expenditure in India has increased nearly 300% during last ten years. (NSSO 2015). More than 80% of the expenditure is met by out of pocket (OOP). Rural households primarily depended on their 'household income / savings' (68%) and on 'borrowings' (25%), the urban households relied much more on their 'income / saving' (75%) for financing expenditure on hospitalizations, and on '(18%) borrowings. (NSSO 2015). Out of pocket (OOP) expenditure in India is over 60% which leads to nearly 6 million families getting into poverty due to catastrophic health expenditures. AB-NHPM will have major impact on reduction of Out Of Pocket (OOP) expenditure. leading to improvement in quality of life. On 2nd October 2014, govt. launched Swachh Bharat program to eradicate the open defecation practice from the country and promote cleanliness. Open defecation is the root cause for a number of communicable diseases like diarrhea, dysentery, Typhoid, paratyphoid, Hepatitis and Cholera, among the common ones. Going with the same spirit, to uplift the mental and physical wellness of people, YOGA was promoted with full enthusiasm and with the efforts of Indian government. 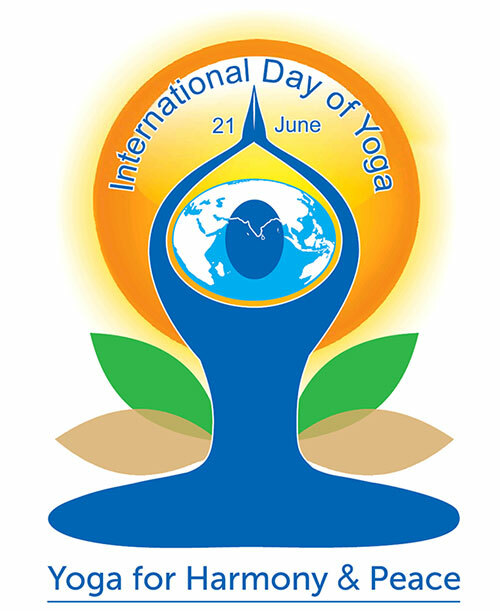 In a rare sequence of events, with 177 nations as co-sponsors, out of 193 member states, the United Nations declared June 21 as International Yoga Day, accepting the soft intellectual power of ancient healthcare systems of India. Thus, the Govt. 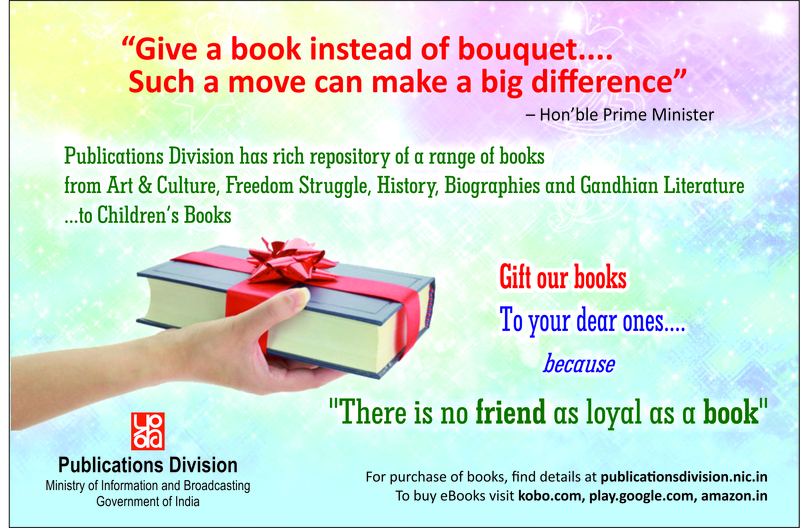 is taking concrete steps to realize the dream our Prime Minister has for the country. As he has said "Sankalp Se Siddhi Tak" these are the steps in the direction of Health For All. These are in line with our dream of NEW INDIA - Ek Bharat , Shrestha Bharat, Swachh Bharat, Swasth Bharat. One can hope that effective and meaningful health care will reach to the masses. (The author is a Delhi based Health expert) Email: ankurgarg007@gmail.com Views expressed are personal.